So the holidays are a pretty crazy time of year for everyone. Add in therapy, volunteering at my kids schools, a sick grandma, work and a blog and something is bound to get left out. Hence the lack of posts lately….I am sorry. 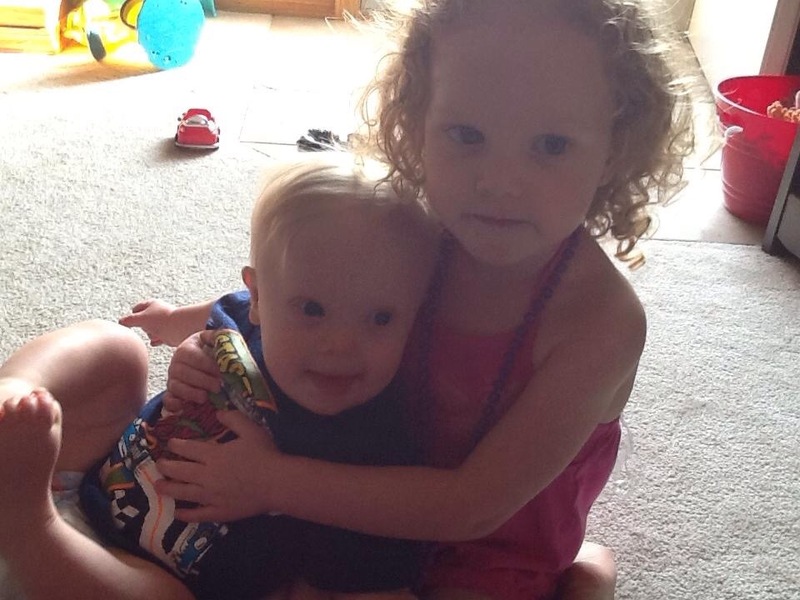 When I was pregnant with Gabe I thought over and over about how Abi would treat her brother. An irrational part of me thought that she would see that he was “different” and not want him. I was worried that she would feel neglected and left out. I had no idea that those things would really happen, but not because Gabe was born with Down syndrome, but because he was born in general! The first few days we brought brother home from the hospital, Abi was clingy and unhappy. Baby was getting way more time than she was with mommy and she didn’t like that! But after the newness wore off and I perfected the mommy juggle Abi began to tolerate her brother, even going so far as to snuggle him, share with him and cram his pacifier into his mouth every now and then. Then Gabe began to move. He started first by grabbing and pulling her hair. Then he began rolling front to back and back to front across the floor to get to her. Then he mastered the belly creep and before long he was chasing her down on his hands and knees. Little by little her tolerance of him taking her toys was exhausted and a love hate relationship was formed. He loved her and she hated the fact that he did! Anywhere Abi was Gabe wanted to be there, watching and staring at her with adoration. Attempting to do the things that she was doing, even if that meant using the specific toy that she had to do so. As a mom, I began to grow concerned when Abi began to tell me that she didn’t like brother, because he took her toys and smelled like cheese, which apparently made her gag. I began to watch, hoping that I would see a glimmer of love somewhere, and that their bond wasn’t really just one sided. And then it happened. Gabe was playing with another child, who promptly bopped him on the head, twice and made him cry. Out of nowhere came hero big sister, crouching behind poor beaten baby brother, guarding him as if she were a mama grizzly. She glared and snapped her fingers at the little offender and comforted her “Baby Chubs”. Despite what she says at home, when we are out in public, she is his protector and he is her comfort. The two of them always aware of where the other is and often looking up to check on one another. I know that siblings don’t always get along, but that’s just part of sibling love. It’s a special kind of love, formed out of necessity and tolerance, but grown over time to be an unshakeable bond. I can’t say I always like my brother (sorry ky 😉 ), but if you mess with him, you better watch out for sister! I know that as the years go by we will act as referees in a variety of battles, but deep down I know that Abi loves her brother and that he absolutely adores her. Check out the Gabe Logan Production, “Sibling Love“!